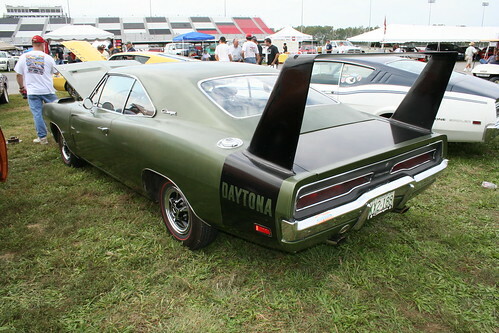 If you like the winged cars from Chrysler you have to check out our Feature Car page and the TWO 1969 Dodge Daytonas we have there. These were photographed at the 2008 Monster Mopar Weekend in St. Louis earlier this year. These cars represent the Dodge warriors that hit the NASCAR race tracks in 1969 to do battle with the aero cars from Ford and Mercury; the Ford Talladega and Mercury Spoiler II. You can read and see more about these two cars on our site at our Museum Page, just Click Here. The first is an all original unrestored example of a 44o with automatic transmission. It is driven regularly and shows it but drew as much attention at the show as any car in the Aero Warrior Coral. It is owned by Jim and Delma McCauley. 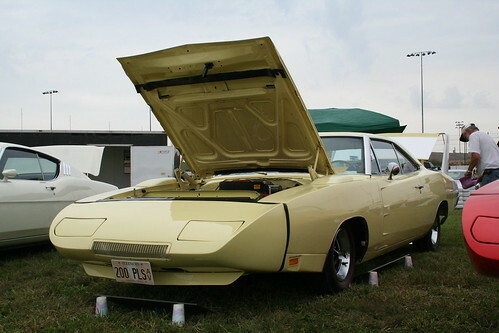 The second 1969 Dodge Daytona is also a 440 automatic but is beautifully restored and owned by Dan Printz. The weather at the show was wet and chilly but both owners as well as many other were not a faid to bring there cars out and show them off. You must go to our Feature Car page to get a full appreciation of the restoration work on this beautiful winged warrior. If you would like to see more on the other cars at the Monster Mopar Weekend Click Here. With car buffers, polishers & buffing pads from Autogeek.net, now anyone can polish their vehicle’s paint to perfection!